Earth Day, April 22, is a wonderful opportunity to bring awareness of our world and the environment to our children. In preparation for this great day, I have selected some newly released books that I believe will help spread the word about ways in which we can work together to make our world a better place. BIG EARTH, Little Me had me at the cover. The title is a great representation of what is inside, the illustrations are “earthy”, and the words printed with soy ink bring home the message that this truly is an earth conscience book. I can help the Earth. Children are reminded and encouraged to turn off the water, use both sides of the paper, and many other kid friendly exercises. Even some adults, including myself, can learn from this book — have your kids use a lunch box. The book also includes some interactive lift the flaps which will add to the appeal of this great little book that every family should own. Jennifer Saves the Planet, and Maya, or anybody for that matter, because this book comes personalized from www.frecklebox.com. If ever there was a book that could encourage your child to take action in “saving the planet”, this is it. What child can resist a book in which they have the leading role? I know my daughter can’t. We received a copy of this book about a week ago, Maya Saves the Planet, and it has been read every single day, at her request. The very young will enjoy hearing the sound of their name. Children a little bit older and recognizing the letters of their name will be astonished by the clever images — every page contains your child’s name. Early readers will be excited to read their own name, and will undoubtedly enjoy this environmental rhyming treat. and be a real live super kid! 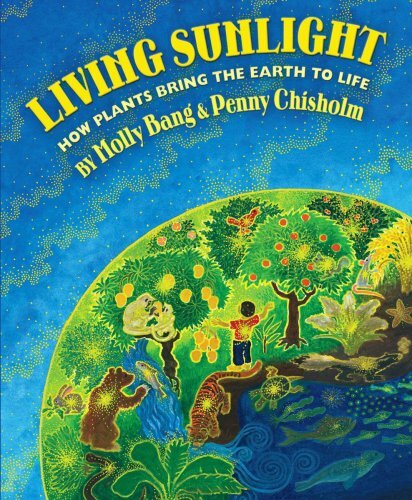 I can’t resist saying that this charming book titled Living Sunlight: How Plants Bring Earth to Life is heart-warming! Who knew that learning about how life works, including photosynthesis, could be so moving. The authors, Bang and Chisholm, have created this book with the purpose of bringing attention to the cycle of life and how everything and everyone is connected — “unity of all life”. The simplicity in which they explain this cycle makes the book a great introduction for little scientists and harvests an awareness that every child should be exposed to. I would go as far as saying that all elementary and middle school classrooms should have this book shelved for easy access. I’m impressed and I haven’t even mentioned that this book was printed on paper containing 55% recycled content and 25% post-consumer waste. we would have no oxygen. For more environmentally aware books check out our Environment & Ecology: Earth conscience category.